This strategy has been compiled in consultation with the NSW alligator weed reference group which consists of key stakeholders across the state. It is an initiative of NSW Department of Primary Industries and supersedes the NSW Alligator Weed Strategy 2000-2005. The NSW Alligator Weed Strategy aims to prevent new incursions, ensure the early detection of any new incursions and actively manage existing infestations. Alligator weed is well established in some areas of NSW, this Strategy prioritises management activities that offer the greatest benefit and outcomes. 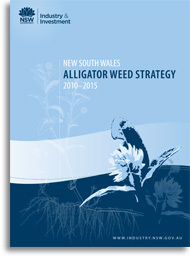 For information about alligator weed see NSW WeedWise.